Changing the Color, text and effects of the Ticker Bar. Each product can be enabled/disabled to be shown in the Ticker anytime. Custom Title for each product to display in the ticker. The Product Ticker is a magento extension that proves completely worthy for your eCommerce website. This extension is effective in promoting your product in a smart way. Any user who visits your website will get to see all your products displayed at the top of your website in a tickering fashion. By installing the product ticker extension in your magento website, you can promote your products by flashing it as quick title in the head of your site in all the pages. If you have a promotional offer or special discount for a particular product, you can simply display them in the top of your website with a catchy title for that particular product. The best feature is that it will display any number of products in all the pages of your website that is been added in the product ticker. 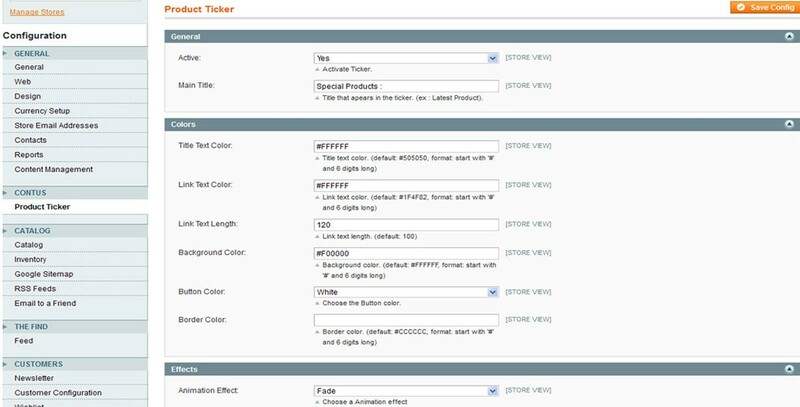 Using this Magento Product Ticker, we can change the color, text and effects of the ticket bar. It acts as promotional tool for your online store and increases sales. Good and configurable module. Support was good too. Thanks!